AutoText is a database of stock phrases or graphics that you create which can be called upon at the drop of a hat. This boiler-plate text can be set up in both Word or Outlook in the same way. The great thing is that you can format the text in any way you like and it will reappear exactly as you want it. 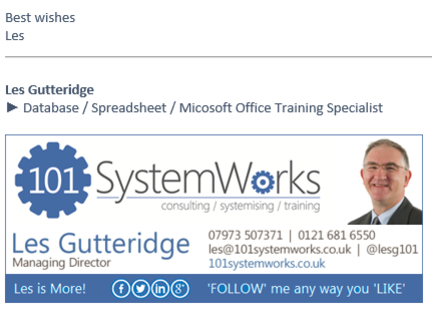 See the screenshot below of the AutoText version of my email signature. Scanned real signaturesWell, that’s all for this time. All you need to do to set up an AutoText entry is think about its content, its formatting and choose a memorable trigger name to recall it. The easiest way to modify an AutoText, is to resave the modified text as before under the same “trigger” name because Word will ask if you want to overwrite the current version with the new version. I would love to hear your creative ideas about using AutoText.